The articles of incorporation of First Unitarian Church of Omaha were signed on August 22, 1869, by twenty-six men and women prominently identified with the early life of Omaha. Its first settled minister was the Reverend Henry E. Bond. A small brick chapel was built at 17th and Cass and dedicated in 1871. The Reverend Newton M. Mann was called in the fall of 1889. Mann published several books and was the first American minister to accept and proclaim the philosophy of evolution. In 1916 the Reverend Robert F. Leavens (author of Great Companions) was called. The present building at 31st and Harney was built and dedicated in the fall of 1918. The church was designed by Omaha architects John and Alan McDonald. The church's early years were marked by moves on both the theological and physical levels. Theodore Parker's philosophy, the use of reason and common sense, had been brought to the Midwest by Unitarian ministers, notably the Reverend W.E. Copeland and Newton Mann. In 1929 the Reverend Laurence R. Plank began a seven-year ministry. Church attendance was high, a not unusual development during times of economic depression, and Plank spoke to an overflowing audience each Sunday morning and for a successful series of evening lectures. In 1931 Omaha's beautiful Joslyn Museum opened its doors to the public, a gift of Sarah Joslyn in memory of her husband. Both were members of First Unitarian Church of Omaha. Mrs. Joslyn also gave the church its Aeolian-Skinner pipe organ. The Reverend Charles W. Phillips was minister from 1956 to 1960. Sponsored by the American Christian-Palestine association and Omaha friends, Phillips made a three-week study tour of Israel and Arab countries. A collection of his sermons, No Graven Image, was published by a member of the congregation. During the eleven-year ministry of Vester L. "Van" Vanstrom, the church's 100th year was observed. A committee on social justice was active and, with other Unitarian ministers, Vanstrom took part in the memorial march in Selma, Alabama, for the Unitarian civil rights martyr Reverend James Reeb. First Unitarian Church purchased property and a building at 3012 South 119th Street, which was dedicated as Second Unitarian Church on January 12, 1974. From 1976 to 1996 the pulpit was held by the Reverend Ronald Knapp. Highlights of Reverend Knapp's ministry include , major renovations, several Sunday morning television broadcasts, the organization of Nebraska Advocates for Nursing Home Residents, and the church's attainment of National Landmark designation. The 75th anniversary of our building, an historic example of Georgian Revival architecture, was observed. Ron Knapp, now retired, continues to serve First Unitarian Church of Omaha as Minister Emeritus. Reverend Richard E. Benner, current minister of First Unitarian Church of Omaha, was installed on March 1, 1999 with the Reverend Forrest Church of New York City serving as principal speaker. On this investigation of the the First Unitarian Church of Omaha, the bulk of activity occurred in the downstairs office waiting room area. This activity included various cold spots recorded, the feeling of a presence in the room, and goosebumps. On one occasion, one of the teams witnessed a tall, black, shadowy figure move around the room, were able to get two of the doors to open and close on command and experienced a loss of time. The team felt as if they had been in the room half an hour, where in all actuality, they had spent two hours in the room. Unfortunately, there was no video camera in the room to record these events that took place. No EVP's were captured on the audio recorders. When a second team spent some time in the room (they were unaware of the first team's experiences in the room), they also felt a presence in the room, recorded cold spots, one of the investigators got a headache, another felt noxious, and two investigators felt a heaviness in their chest. One very strange incident that happened, was when a guest investigator, Deb, who did not know everyone in the PRISM team, sat down on a bench in the church to relax. She had sat down next to a woman whom she thought was a PRISM investigator, and spoke to her about various things that had occurred throughout the investigation. Later that night, she decided to try and locate the woman again, and to her surprise, she realized that the woman that she had been speaking to was nowhere to be found in the church. She quickly realized that the woman was not a PRISM investigator, and that the woman she had been talking to was never in the church to begin with. Did Deb actually interact with a female spirit or is there a logical explanation for what happened? We may never know. 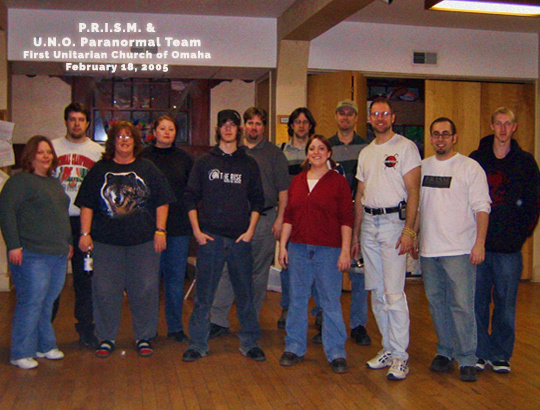 This night at the First Unitarian Church of Omaha we captured various EVP and interesting photos including orbs and apparitions. Many of the investigators had sensations of tingling in the hands, the feeling of being watched, and a couple of the investigators even had a premonition of an older woman with a large hat. At one point in the night, in the upstairs main sanctuary, a few of the investigators witnessed for or five black apparitions flying overhead, coupled with a strange sensation of sadness. At this point, two of the investigators began to cry. Unfortunately, these apparitions were not captured on film or video. For the most part, EMF readings were normal. There was one time in the sanctuary when five of the investigators were sitting in chairs, a circle formation, conducting an EVP session. At one point in the session, when we asked if the spirits would show themselves, the EMF meter spiked and at that time, various orbs were captured on film. The second time was when one investigator noticed an unusually high EMF readings around two of the four pastors' chairs in the main sanctuary.